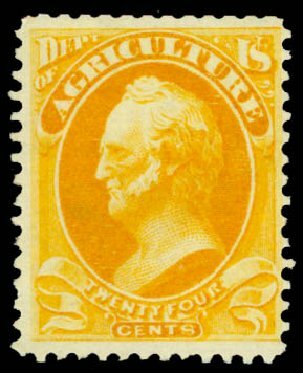 USA (Scott O8S) 1875 AGRICULTURE 24¢ YELLOW, SPECIMEN Fresh and bright, unused, no gum as issued, very fine and attractive. 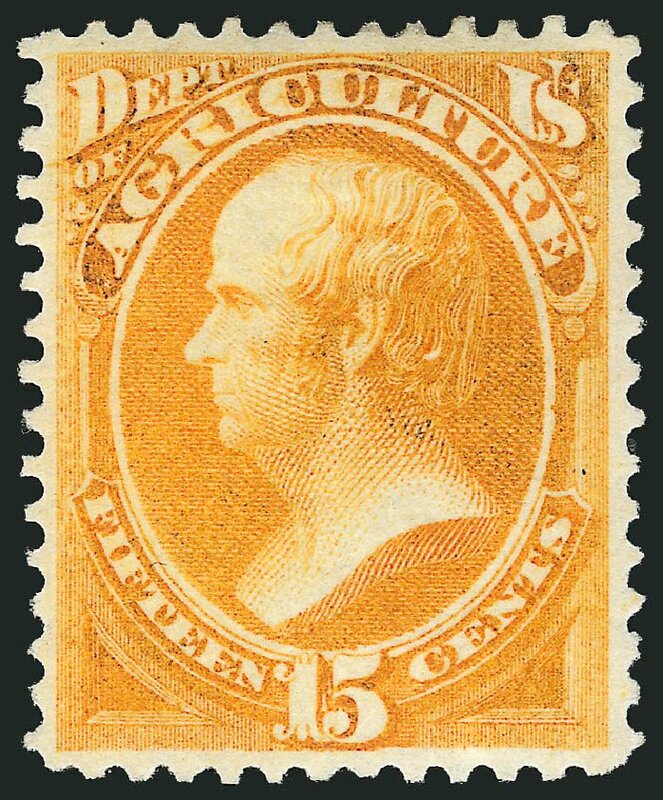 Scarce stamp, only 352 sold. Cat $400. 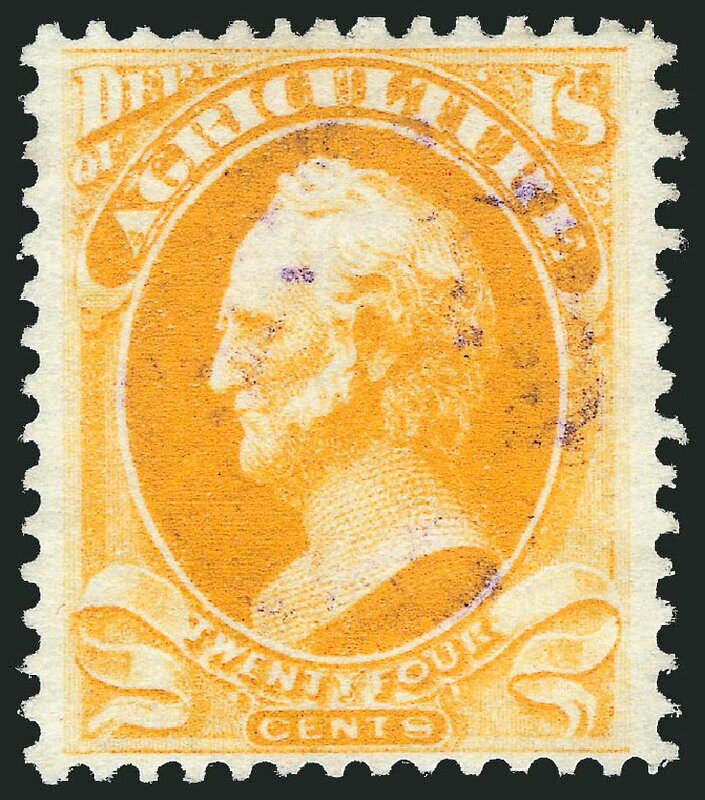 U.S.; Officials, Agriculture Dept., 1873, 24¢ Yellow, #O8, l.h., rich color, Very Fine, PSE (2008) cert. Scott $425. Estimate value $120-130. 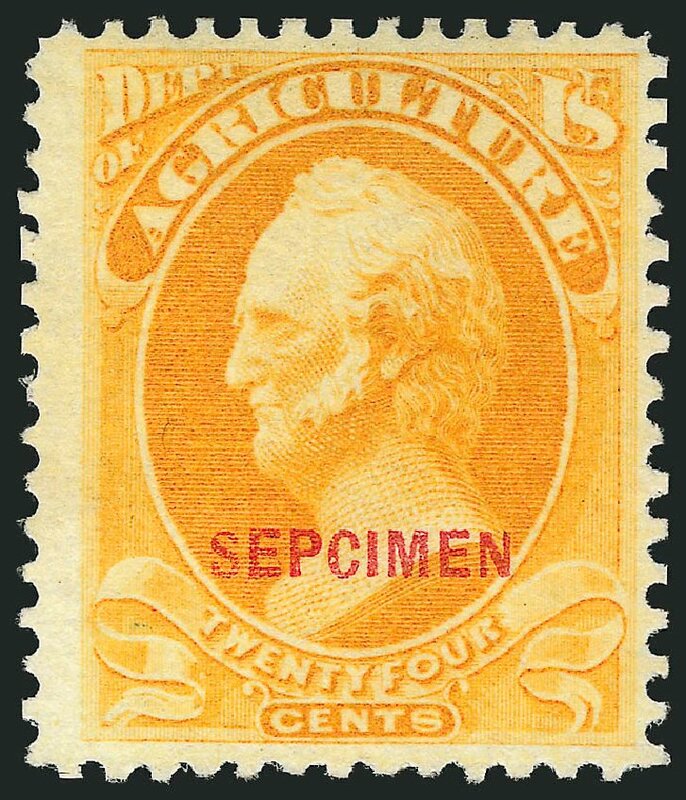 24c Agriculture, “Sepcimen” Error (Scott O8Sa). Without gum as issued, brilliant color, choice margins and centering, exceptionally fresh VERY FINE. 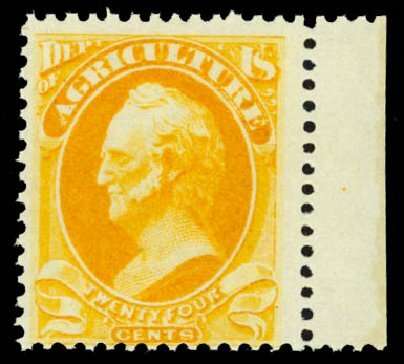 THIS IS THE FINEST OF ONLY THREE RECORDED EXAMPLES OF THE 24-CENT AGRICULTURE “SEPCIMEN” ERROR. 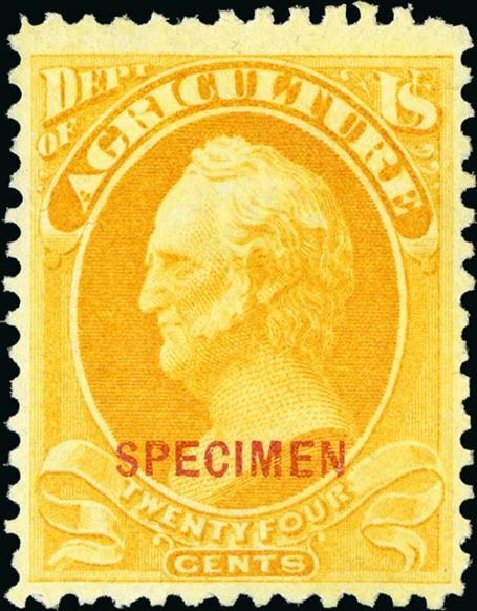 Robert Markovits recorded only three examples of the 24c Agriculture “Sepcimen” error (2004 Bennett sale). 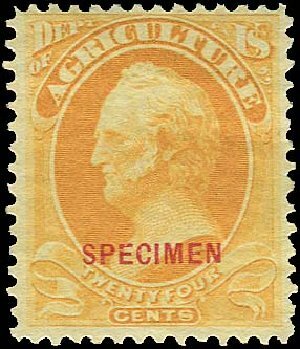 Only 352 copies of the 24c Agriculture Special Printing were sold, but it is not known how the stamps were taken from the sheets or if full sheets were exhausted before breaking a subsequent sheet. The ex-Markovits copy, last sold in a Siegel sale in 2005, is faulty and scissors-separated into the perfs at top. The ex-Sheriff copy (Siegel Sale 752, lot 484) is not as well-centered as the example offered here. 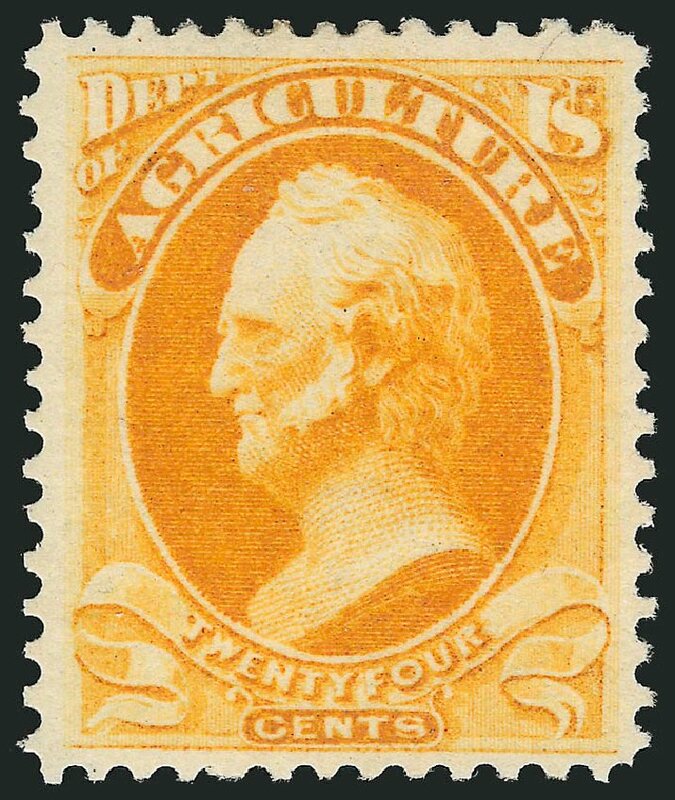 Agriculture Dept., 1873, 24¢ yellow (Scott O8), o.g., previously hinged, exceptional example of this difficult stamp, a most impressive stamp with astounding color, Fine to Very Fine. Scott $425. Estimate value $200 – 300. 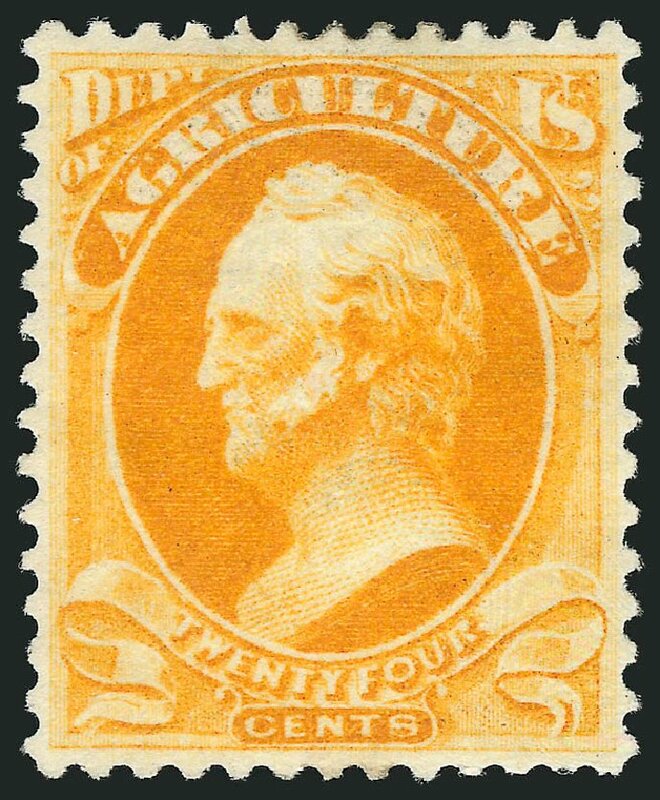 Agriculture Dept., 1873, 24¢ yellow (Scott O8), o.g., incredibly bright and fresh, Fine to Very Fine, 2014 P.S.E. certificate. Scott $425. Estimate price $150 – 200. Scott #O8S, 24c Agriculture Dept. 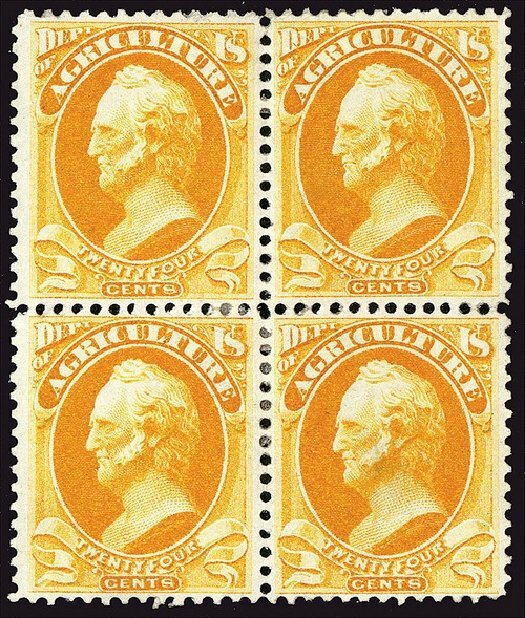 with “Specimen” overprint, without gum as issued, well centered example of this special printing, brilliant color, very fine; only 352 issued. 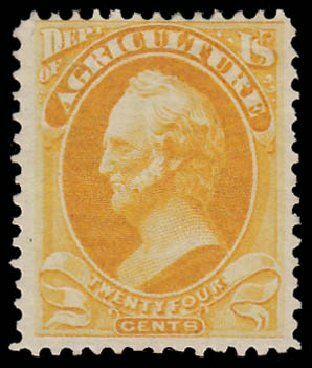 Agriculture Dept., 1873, 24¢ yellow (Scott O8), o.g., never hinged, extremely handsome example in immaculate mint condition, with gleaming bright color and nice balance, an incredibly difficult stamp to find Post Office fresh like this, Fine to Very Fine, 2013 P.S.E. certificate. Scott $950. Estimate $600 – 800. 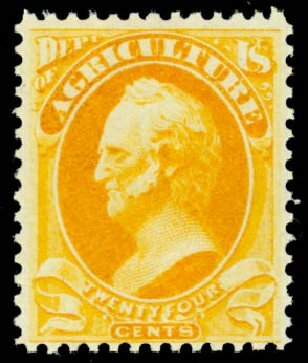 Agriculture Dept., 1873, 24¢ yellow (Scott O8), right margin single, o.g., never hinged, impressive mint stamp featuring resplendent color, really scarce when found in such a pristine mint state, Fine, 2013 P.S.E. certificate. Scott $950. Estimate value $500 – 750. 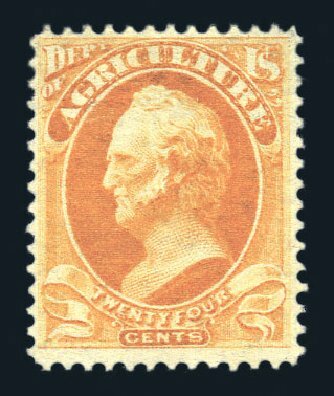 Scott #O8, 24c Agriculture, select mint single, precisely centered within equal margins, radiant rich color, o.g., extremely fine; 1999 PF certificate. 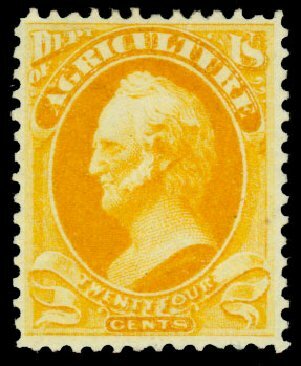 Scott #O8, 24c Agriculture, very scarce mint block of four, well centered, brilliant yellow color, o.g. that has has been somewhat disturbed from hinge removal as is often the case with officials, very fine and rare in blocks; 2011 PSAG certificate. 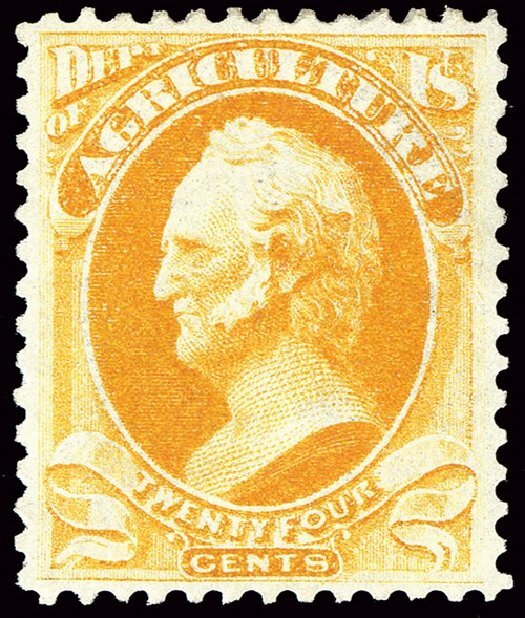 Agriculture Dept., 1873, 24¢ yellow (O8), o.g., lightly hinged, an extraordinary high quality example with mouth-watering color, Very Fine. Scott $425. Estimate price $300 – 400.